It’s good to see another chess club take the step to digital technology. Prescot & Knotty Ash have now followed Formby and Atticus (and perhaps others too?). The TV digital switchover started last year and by 2012 the analogue signal will be switched off. And it’s not just in TV, the world is going digital. You might not think this affects you but it does. In many large-scale events such as Blackpool, 4NCL, Gibraltar, British and EU Championships, digital clocks are used and are here to stay. 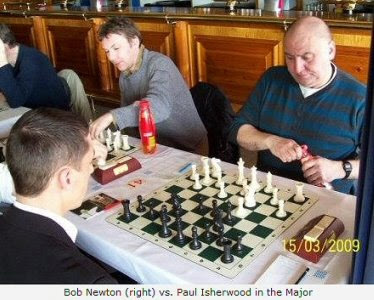 A normal feature of electronic clocks is that they only add the second time period (15 minutes in MCA league) when one player’s time has reached 0:00 and not after the 35th move. This is because discrepancies can occur with the move counter (e.g. double pushes). So if you make your 35th move within the first time control just continue play and the clock will add on your extra time automatically. There is no need to stop the clock or make any adjustments to it.